Abstract artist Alexander Johnson uses patterns from photographs taken by his father in a Spitfire over the Iberian Peninsula and North Africa in 1942. These scrap-book images were some of the first that captured his imagination as a child and working in his signature neon colours he pays homage to his father and the pilots who risked their lives in the conflict and celebrates the beauty of the original monochrome photos.In the exhibited work we can see street patterns from Cadiz, Barcelona docks and Salamanca, in others suggestions of mountains, desert and a stylised spitfire. 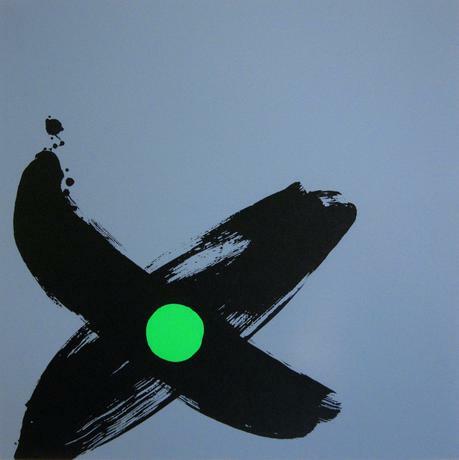 The PILOT silkscreen and bronze sculpture are meant as abstract portraits of his father – the central green circle symbolic of the vulnerability and youth of the WW2 pilots. The exhibition comprises limited edition silkscreen prints, oil paintings and a bronze ‘PILOT’ sculpture. The exhibition runs from 4 – 15 November daily from 11-6 except Mondays. GALLERY 40, Gloucester Rd, Brighton, BN1 4AQ. This entry was posted on October 10, 2014 by mptask in Brighton, Gallery40, November 2014 and tagged Alexander Johnson, art, art exhibition, brighton, Gallery40.